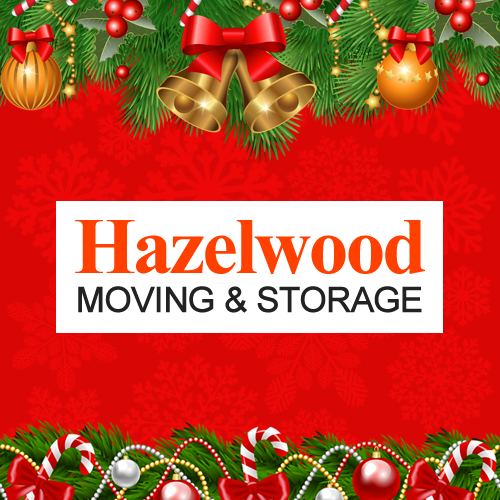 Happy Holidays from Hazelwood Allied! Move for hunger is an organization we support every year because there's nothing more heart breaking than a child or family without food, especially during the holidays. Move for Hunger is a powerful force in fighting hunger in our community. December has been a busy month for us. We were recognized as top 1% of Moving Companies Nationwide in November, and won the Women's Choice Award for the 3rd consecutive year. The recognition seems to have skyrocketed our popularity. 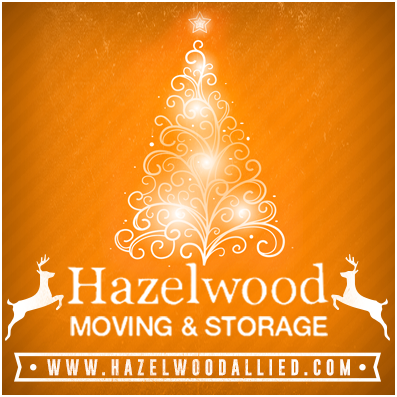 As a family-owned business, Hazelwood Allied Moving and Storage understands the joy of being together with loved ones. But, as a Santa Barbara moving company, we also know that sometimes families have no control over when they need to move. Work with a professional moving company: Don’t add extra stress to your holidays by trying to tackle too much yourself. Our moving company in Santa Barbara has tremendous experience in all types of moves, and can handle all of the details while you focus on what is important to your family. Keep traditions alive: Feelings of love and family don’t need to be associated with one particular house. If your family has a tradition that you observe every year, make sure you find a way of doing it in your new location. Your children will love it, and you’ll be making your new house feel like home even faster. First things first: Set aside a few of your most cherished holiday decorations, and pack them in a box marked, “Do open by December 25.” No matter what else is going on in your new home, open this box first and get some familiar decorations up so it will still feel like the holidays. Children will forgive sleeping on the floor, or eating macaroni and cheese for dinner, but they will not forget the year you didn’t celebrate Christmas. Work with what you have: If your new home is full of boxes and moving cartons, have your kids draw some holiday scenes on them or decorate them, to make the new location look more festive. When you are contacting Santa Barbara moving companies about a move during the holiday season, make sure you find one with the experience and compassion to make sure your holidays are still cheery and bright. Happy Holidays from your careful Santa Barbara movers! Q: What credentials and references does your company have? 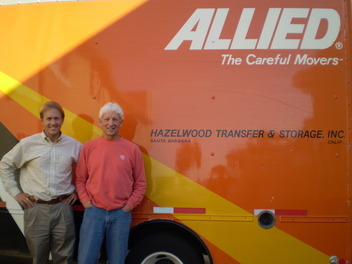 A: Hazelwood Allied has been in business since 1918 and is rated A+ by the Better Business Bureau. We are also a registered Certified Moving Consultant through the American Moving and Storage Association and we have numerous satisfied customers. Q: Do you offer business moving services? A: Yes. We offer commercial moving services. We can move large equipment, computers, furniture and files. Q: I don’t want to pack my belongings myself. Do you provide packing services? A: Yes. In addition to providing packing supplies, we can do the packing for you from kitchen dishes to furniture. Mannheim Steamroller Christmas: December 29, 2016 - For a quarter of a century, Mannheim Steamroller has been entertaining audiences for the holiday season. This year The Granada Theatre hosts this Grammy-award winning sensation. Ticket prices range from $34-$93. 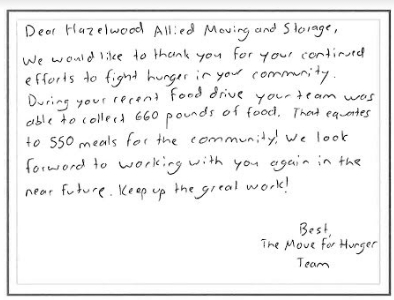 Your donations to The Move for Hunger organization is inspiring. Not only that you prove to the people of Santa Barbara that you are a reputable company for residential and commercial moves, but you have a great heart in helping children who are in need. Keep up the good work and may 2017 bring you more success.